Armistice Day Blizzard, Minneapolis. From the Minnesota Historical Society. Click to enlarge. 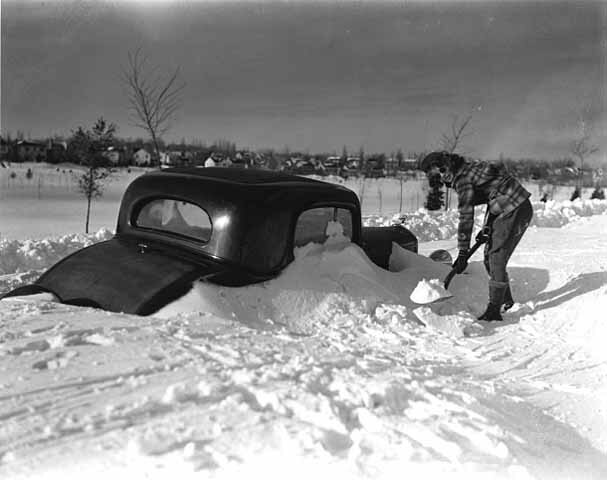 70 years ago today, biting cold winds and blowing snow unexpectedly struck the Midwest. 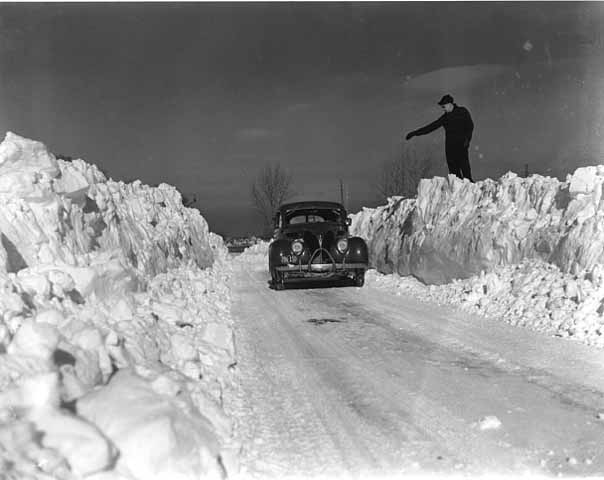 On November 11, 1940, the Armistice Day Blizzard brought snowfall totals of up to 27 inches, winds of 50 to 80 mph, 20-foot snow drifts, and temperature drops of up to 50 °F (30 °C) to parts of Minnesota, Wisconsin, Iowa, South Dakota, and Nebraska. The day started off unseasonably warm, prompting many hunters to go out looking for ducks. However, the National Weather Bureau/Service did a poor job of forecasting a strong low-pressure system that would come up from the Texas/Oklahoma Panhandles. 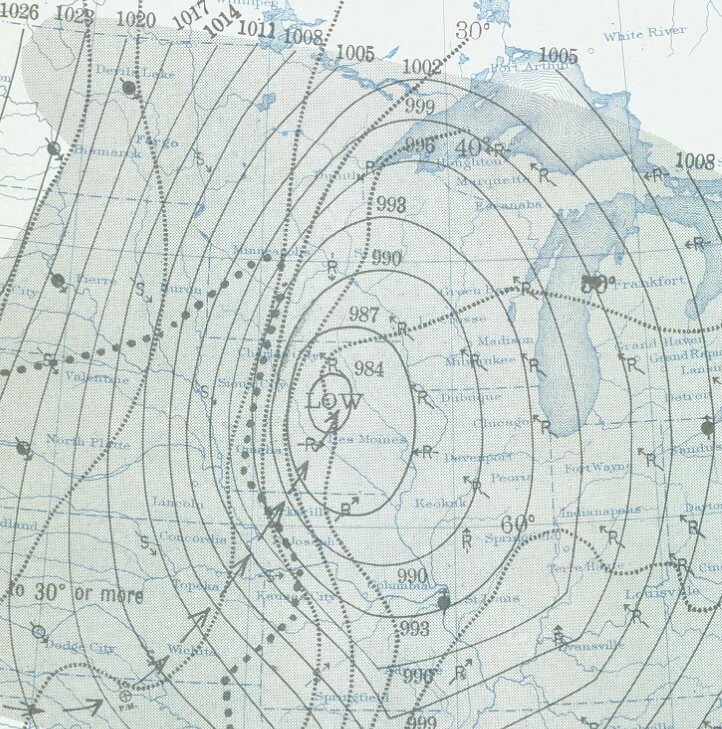 The lowest recorded pressure in the center of the cyclone was 971 mb in Duluth, Minnesota. Between the strong pressure gradient and a strong temperature gradient, temperatures plummeted and a blizzard wreaked havoc and sadly caused around 150 people to lose their lives (many were on ships on Lake Michigan, while many others included the unprepared duck hunters). NOAA National Weather Bureau/Service surface map, showing the track of the cyclone, pressure, winds, and temperature lines. From Wikipedia. Click to enlarge. Track of the low. From NWS La Crosse. La Crosse, WI temperatures (F) for November 11, 1940. Following the blizzard, the National Weather Service expanded forecast duties to 24 hours and expanded the number of forecast offices. 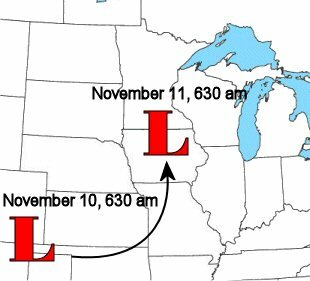 For more information, see the NWS La Crosse, Wikipedia, the Minnesota Historical Society (photos), and The 1940 Armistice Day Blizzard (on the Alabama Weather blog). Here’s the Climate Prediction Center‘s outlook for November, December, and January, as of October 21. Keep in mind that the colors shown are probabilities of having above or below normal temperature or precipitation. A is above, B is below, and EC is equal chance. These maps are primarily based off of ENSO (El Niño / La Niña). We’re currently in a La Niña pattern, but there are other factors that play a role in what our climate may do in the next few months, so take these maps with a grain of salt! 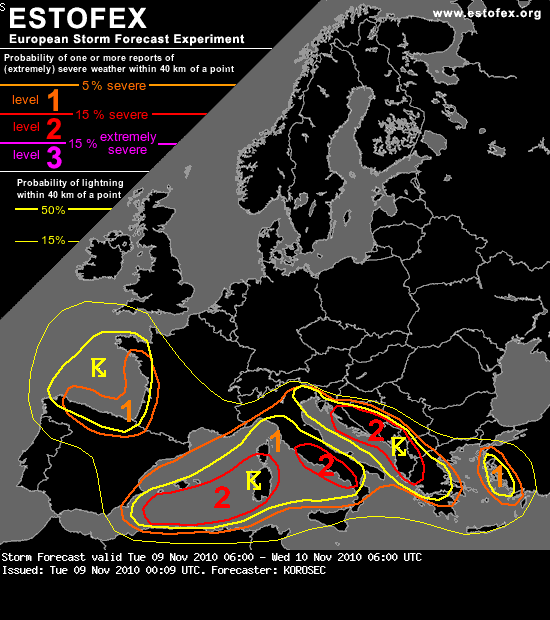 This week’s post in the global weather and climate series features Cagliari, Sardinia, Italy (click for a Yahoo! maps link). Around Cagliari. Click to enlarge. Courtesy of Wikipedia. 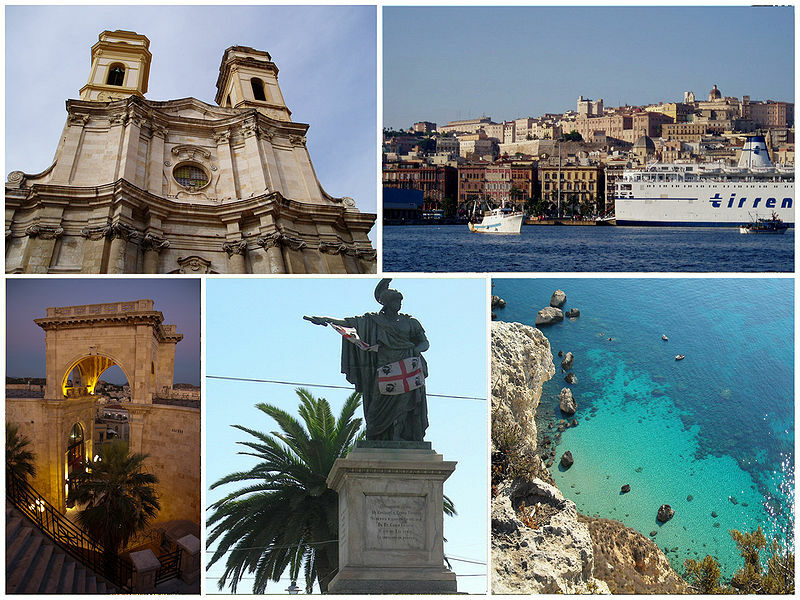 Cagliari is located on the southern coast of Sardinia, an island and Italian province off the western coast of Italy. Cagliari is the capital of Sardinia and is home to nearly 160,000 people (about 400,000 in the metro). This city was established some time in or before the 7th century B.C., between the sea, fertile plains, and mountains. Today, Cagliari has one of the largest fish markets in Italy and tourism is a major part of economy. 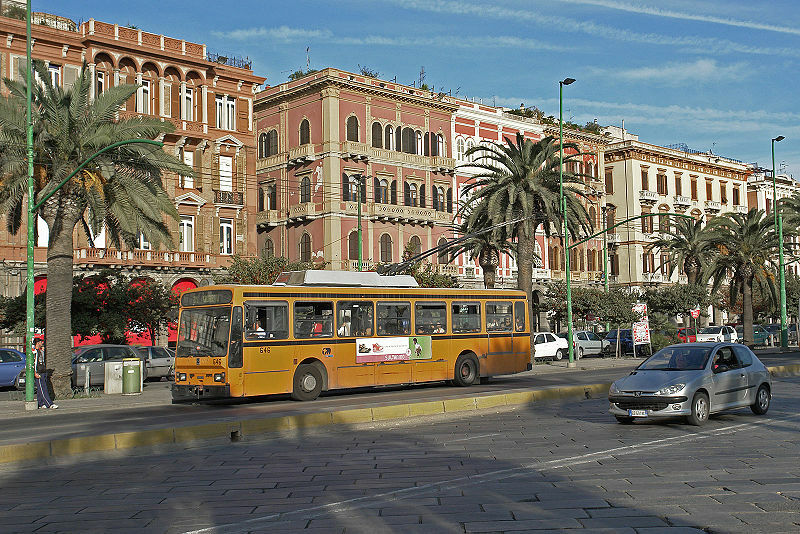 Via Roma in Cagliari. Click to enlarge. Courtesy of Wikipedia. Current weather: This week in Cagliari, highs are in the mid-60s and lows are in the low 50s. Skies are expected to be mostly clear, after a chance of rain Wednesday night and Thursday night. For weather maps and information on current and forecast Cagliari weather, see the Meteo Italia (Italian’s national weather service, in Italian), Weather Underground, and Weather Online UK (maps and models). For more information on Cagliari, here’s a link to Wikipedia. The National Weather Festival was great yesterday…it was a great experience, and I was able to meet a lot of people! Thanks to everyone who came out. Tomorrow I hope to be back to talking about the weather…but as for today, I thought I’d give one more plug for the items I have on sale through MIDNIGHT (Central Time) TONIGHT. DVDs are $20 (will be $25 after midnight), calendars are $20 (will be $25 after midnight), and prints are 20% off. The National Weather Festival, an annual event at the National Weather Center in Norman, Oklahoma, will take place tomorrow from 9 am to 1 pm. I’ll be there with my chase car (entered in the storm chaser car show), and I’ll also have a booth inside with DVDs, prints, calendars, and T-shirts for sale. I’ll also have some free pens and storm chasing brochures. I’ve been spending a lot of time preparing for this lately, hence the lack of blog posts this week. Between the demonstrations (e.g., balloon launches), tours of the building and research vehicles, storm chaser car show, prizes, booths with weather info and vendors, etc., the National Weather Festival is always a lot of fun. Last year I believe there were around 5,000 people who showed up! As an aside, there will also be fireworks tomorrow night in Norman, as part of a Vietnam Veterans’ celebration. These will be the fireworks saved from the 4th of July, after that fireworks show was rained out.